As strange as it is, our feet change as we get older, becoming wider and longer. You may be growing out of your shoes long after you've stopped growing. A good rule of thumb (literally) to make sure there’s enough room in your shoes is to ensure you have about the width of your thumb between your toe and the front of the shoe. If your shoes are running a little tight, there are some ways to make narrower shoes fit more comfortably. Wear heavy socks to break in the shoes for a few days. Before putting them on, use a hairdryer to heat them, then bend them back and forth. If the shoes are still too tight, dampen socks and stuff them into the shoes. Let them sit until everything is dry. Pull out the socks and try on the pair again. You also can try dabbing rubbing alcohol onto the inside parts of the shoes that are too tight. Widen cloth or soft leather shoes by cutting into the toe area. Cut a triangle that points toward your middle toes. Try on the shoes and keep making the triangle larger until the fit is perfect. Glue along the cut edges to seal the cut areas. Add a clip-on embellishment or bow to hide the triangle. Select shoes in a medium width that are at least one size larger than your normal shoe size. 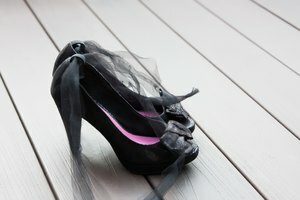 As long as the shoes are comfortable and don’t fall off your heel, many styles can be purchased in a larger size. Ensure your laces are tied comfortably. Medium-width shoes that have laces can offer extra width by loosening the lacing. Generally, eyelets should be about 5/8 inch apart when the shoe is laced. The shoe is too wide if the top eyelets touch and too narrow if the eyelets are more than the recommended 5/8 inch apart. Wear shoes made out of a stretchy material with more give than harder shoes. Real leather usually is more pliable than synthetics such as plastic. Stretch out your shoes with a shoehorn. Use this in conjunction with a shoe-stretching spray or oil that you can purchase in a shoe store. Visit a shoe shop where your shoes can be stretched to a more comfortable width. At shoes stores, measure your foot length and width with a Brannock Device metal tool with sliders. Try on new shoes late in the day since feet swell a bit during the day. This will help you avoid buying shoes that are too small. Don’t buy shoes based on the size -- try on every pair you buy. 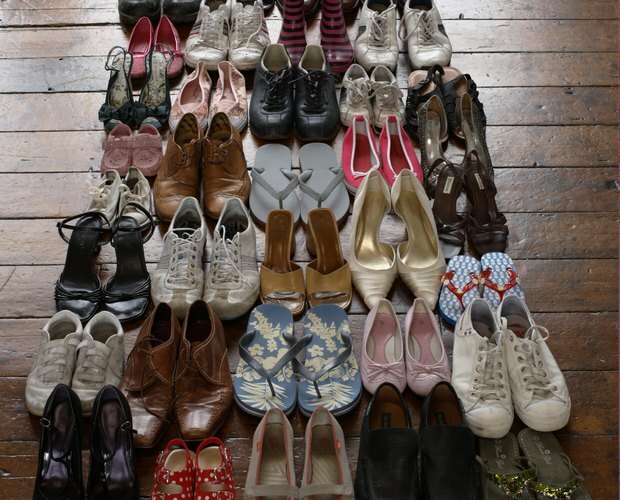 Shoes vary by model and manufacturer, which can mean a half or full size difference than your regular size. Men generally wear a D width, while most women wear a B width. Women with wide feet should look in the men’s shoe section; men with narrow feet should try buying women’s narrower shoes. Look for styles that work well for wide widths, such as rounded toes and lower heels that don’t push your feet forward too far, making the shoes feel tight. Sandals also offer more room in the heel and toe.